For many teachers the last few weeks have been spent sorting, moving, tossing, cleaning, and sighing as classrooms were set up, rearranged, and organized. But there is nothing like the feeling one gets when all the work is done and you stand back to view the results of all your efforts. Everything has a place, the clutter is cleared, and the room sparkles. Take pictures now because this will not last long. Once the children return and the nonstop teaching and learning gets underway every space that was blank will be filled with charts, kids work, and books. While this too is exciting, there will also be a need to keep the clutter at bay and this includes the charts. Everyone knows the expression, “Too much of a good thing,” which can ring true for anything, from ice cream to charts. In our classrooms it is a good idea to anticipate which things we usually end up having too much of and to come up with some possible scenarios so this does not happen too quickly. Charts are often the thing that ends up cluttering our classrooms first and foremost. There are several things teachers need to consider and we will offer some possible solutions so that the charts in your room will add sparkle and energy no matter where they are displayed in the classroom. In Smarter Charts (Making Charts Accessible and Adaptable, p. 43) we suggest creating some designated spaces for your charts that make sense by placing charts near the areas of the classroom that focus on each topic. 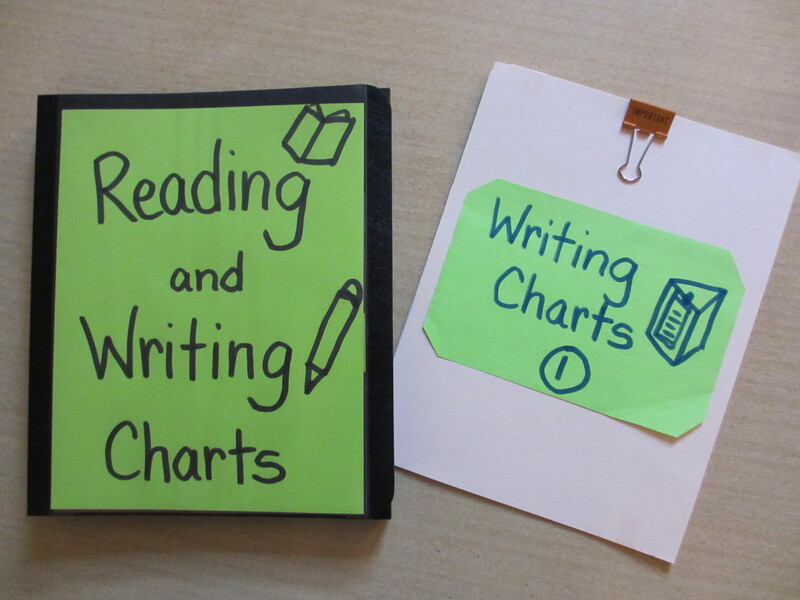 For example, reading charts near the library, writing charts near the writing center, math charts near the math manipulatives, and placing reciprocal charts near each other, like reading charts near writing charts, or science charts near math charts. Writing Charts Hanging Above the Writing Center. Another thing to keep in mind is the size of the charts. Not all charts need to be huge just because the commercial chart tablets available are huge. Cut them down to the space needed, both height-wise and width-wise. Have you noticed that even big books have started becoming smaller so they are not so unwieldy. These so-called “lap books” are easier to handle and they last longer because they don’t bend in half or keep falling off the easel. Also consider whether a chart needs to be hanging up on the wall permanently or whether it might work even more effectively on the tables closer to the children as they work. Shanna Schwartz in her book, Making Your Teaching Stick, called these small versions of charts, “Table Tents.” Table tents bring the charts closer to the children and allow them to be brought out only when needed. This helps deal with chart clutter as well as making the charts more accessible. Office supply stores sell them as “Presentation Easels” or “Portable Display Easels.” The advantage is they can hold quite a few charts, can quickly be changed, and stand sturdily on the table. They also have Velcro closures and can be carried easily in a briefcase or backpack. The downside is their cost. They can cost anywhere from $10 to $25, or even as much as $50 for use by professional photographers and graphic designers. 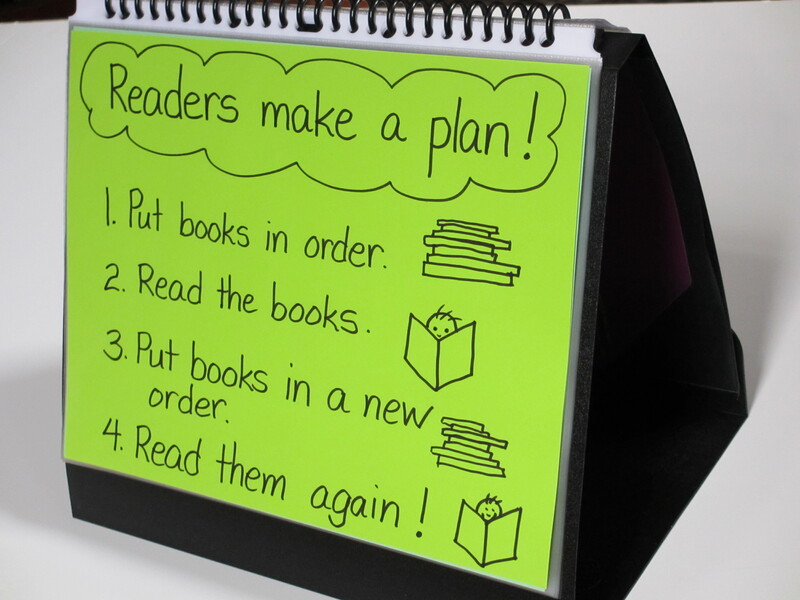 This is a store-bought presentation easel being used to display a reading chart. The good news is that you can easily make these by using simple file folders or three ring binders. Three file folders make a sturdy three-sided table chart that can be stood on end for vertical charts or sideways for horizontal charts. On end allows for hanging three 8-1/2 in. x 11 in. charts. This is nice because the children at each table have three charts at their fingertips. Tip: When you tape together the three folders, keep one side open so the table chart can be folded flat and kept with each table’s container of writing folders, math folders or book baggies. File folder table charts being used in two different ways, vertically and horizontally. 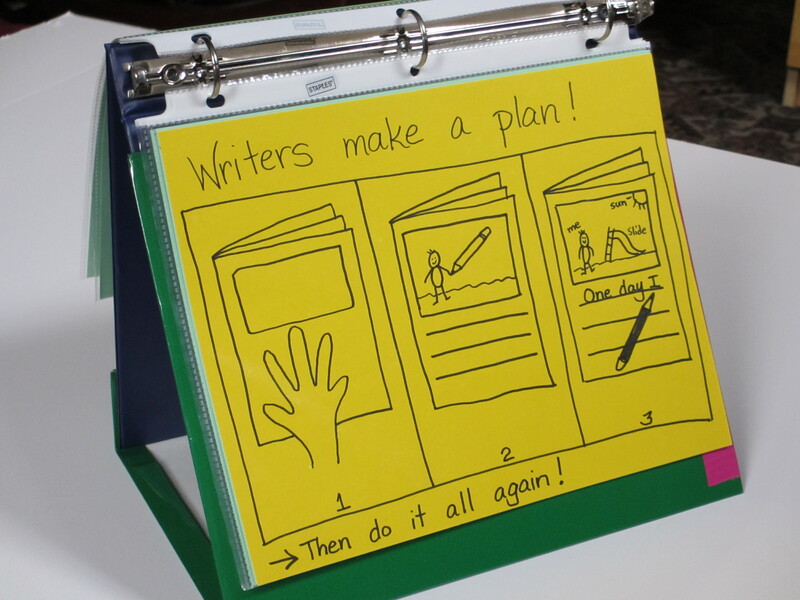 Three ring binders can also be used to create table charts if you turn the binder inside out so the three rings are pointing up and create a base so it stands. One way to make a base is to use a heavy pocket folder and tape one side to the inside of the binder. 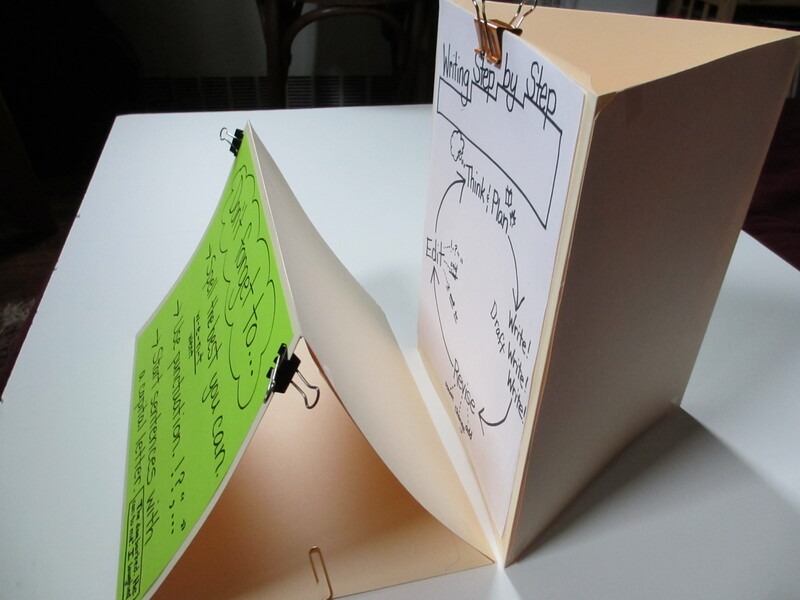 The other side of the folder can be bent up and secured to the binder with velcro. This makes it possible to close the table chart up when not in use. Sheet protectors make it easy to add several charts that can easily be flipped to as needed. A three ringer binder turned into a table chart. With any type of table tent you can include a variety of charts that will support your students as they work. 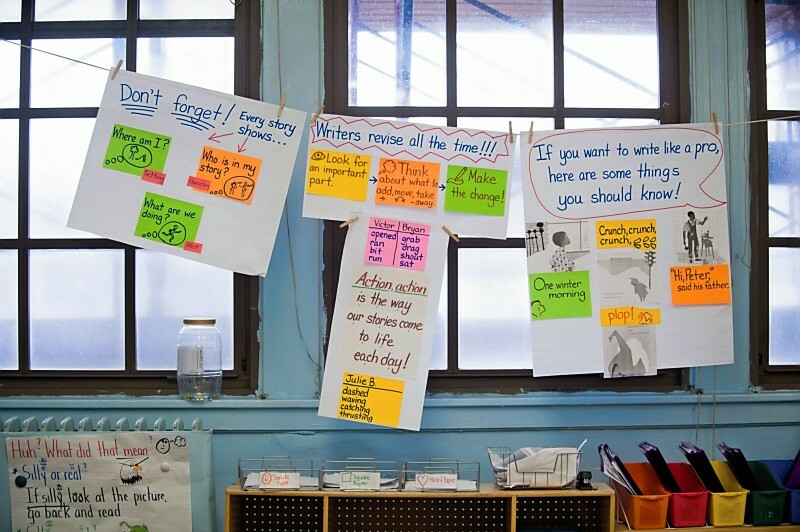 For example, you could include one miniature word wall, a strategy chart, and a routine chart. You might also use one side to include a copy of a class rubric you want students to refer to often. Setting up and taking down the table charts can become part of the table captain’s job as they set up for the workshop each day. Table charts closed up and ready to stow away. Table charts have many benefits. They are extremely important if you have little wall space for hanging charts and also help diminish “chart clutter” that can happen when too many charts are hung up in the classroom. Table tents bring the charts closer to the students who will be using and needing them the most. Kids can easily flip to the charts they need at the exact moment they are needed without having to get up and walk around the classroom. And the more a chart is touched the more it is used. The more it is used, the more children are trying out what is on the chart, which will lead to them no longer needing the chart. It also makes revising and adding new charts quick and easy. Reading and writing charts side by side. Lastly, you can use table tents side by side to highlight the reciprocal nature of two subjects like reading and writing. 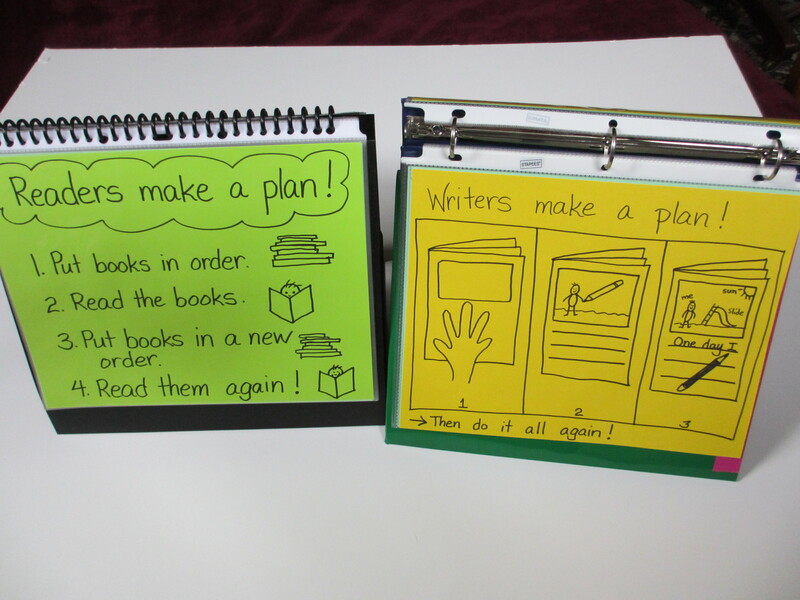 Or you can use the binders to include both reading and writing charts. Color-coding the charts can help distinguish them from each other or you can use dividers to separate the charts by subject or by type of chart (routine, strategy, rubrics, or exemplars). The possibilities are endless and we can’t wait to hear about some of the ways you use table charts to bring your charts closer to your children. We would like to thank everyone who has shared with us their excitement about finally receiving their copies of Smarter Charts. Feel free to write your reviews on Amazon.com or Barnes and Noble.com. Until next week, happy charting!